Giving is truly better than receiving, especially when your generosity can provide income tax benefits. There are a lot of good reasons to make donations to charity, but most boil down to one simple fact: Giving feels good. It’s no surprise, then, that many Americans give money or property to organizations they care about. In fact, some give quite a bit. Itemize deductions. To claim charitable donations on your tax return, you need to itemize deductions on Schedule A. Before making this move, be sure that itemizing will reduce your tax bill more than taking the standard deduction. If you use TurboTax, we’ll figure your taxes both ways and tell you whether itemizing or taking the standard deduction will give you the biggest tax benefit. Keep proof of your gift. If you gave cash, hold on to a bank statement, cancelled check or credit-card receipt showing the amount of the donation. For gifts of cash or property worth more than $250, also keep the written acknowledgement from the charity showing the date and value of the donation. Clothing or household items must be in good shape. Second-hand clothes and the like must be in at least “good used condition.” You can deduct only the value they would sell for in a thrift shop—not what you paid for them. 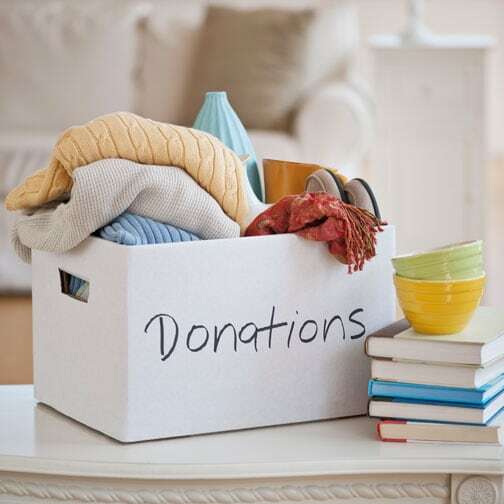 To help you keep track of this information, TurboTax has a tool called “ItsDeductible” that uses eBay to calculate the IRS-approved value of your donations of things like used clothing, coffee makers, toys or bicycles. You’d be surprised by how much these gifts can add up. Get an independent appraisal when giving valuable property. When you claim a donation of furniture, jewelry or other item worth more than $5,000, the IRS wants independent verification of its value. Gifts of financial assets held one year or less. You can deduct the amount you paid for a stock or other security, but can’t deduct any appreciation. In fact, you have to list the gain on your tax return. Donation for which you got something in return. Say you bought theater tickets at a charity auction. You can deduct only the amount you paid over the tickets’ face value. Gifts to non-qualified organizations. Some non-profits aren’t eligible to receive deductible contributions—for example, because they urge people to vote for a particular political candidate. IRS publication 78 lists the charities to which you can make deductible donations. Again, TurboTax will tell you whether your donation meets this requirement. The gift makes up a large percentage of your income. Generally, you can deduct cash contributions in full up to 60% of your AGI, donations of property up to 30% of your AGI and appreciated long-term securities worth up to 20% of your AGI. Anything in excess of these amounts can be carried forward to the next tax year, for a maximum of five years. Gifts of vehicles. In many instances, you’ll get far less by donating your car than by selling or trading it in. The IRS allows you to deduct only the charity’s actual selling price, and requires you to attach a statement of sale to the tax return. If the charity uses your car, rather than resells it, you are entitled to deduct the vehicle’s fair market value. The IRS allows these deductions because they want to encourage charitable giving. Sticking to the guidelines described above will help you ensure that the goodness in your heart translates to goodness on your tax return as well.